A classic standard image of the bend in the Colorado River. The temperature is high, I manage to ping the rear bumper by backing into a metal pole driven into the side of the road where we park. We walk around a quarter of a mile to the start of the sandy path down to the vista. It’s hot and there is no shade. We fill our shoes with sand as we slip and slide down to the view with a thousand other people who seem unconcerned about the heat (did I say it was hot?). The instructions is that not to get too close to the edge and the rocks are soft and overhang and the chance of death is high (we saw no rocks give way, and no one fall to their death). I set up the tripod and the wind is strong, increasing the possibility that the camera will be blown over. I snap four frames – this one, and three for a pano that doesn’t work out. I pack up the camera and shuffle back up the sandy path to the car, the air con, a litre of water and to lick my emotional wounds about dinging the car (no action was taken by the rental company as their visual check of the car was thankfully scant). I get a standard image of the Horseshoe Bend that million before me have. 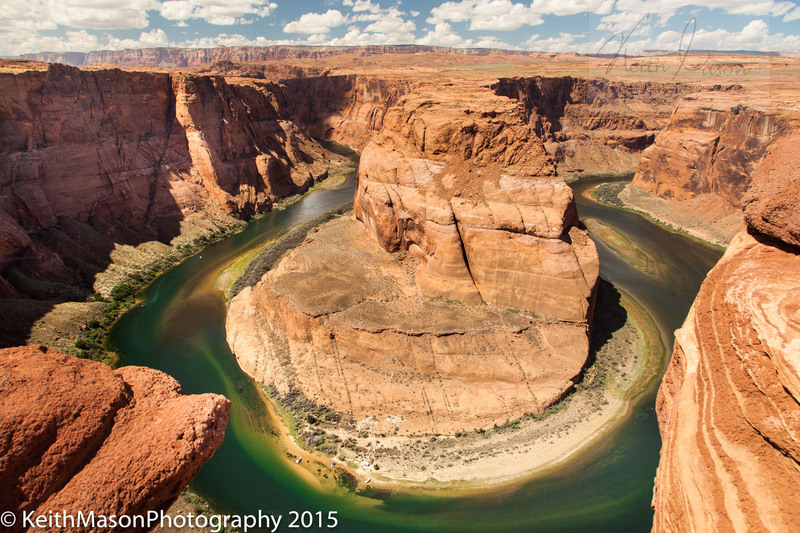 This entry was posted in Countries, Landscape, USA and tagged Colorado River, Horseshoe Bend by keithjohnmason. Bookmark the permalink.